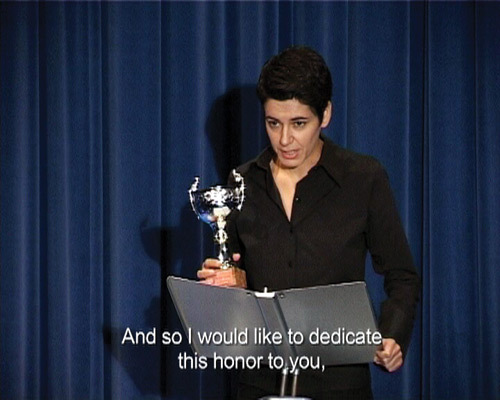 With its absurd television aesthetic, Betty Talks, Part II is a deceptively familiar scene - a young actress accepting an award and giving an excitedly nervous speech, graciously acknowledging the support she has received, emotionally recounting the range of professional possibilities she has been offered. In this case, Betty's systematic acknowledgements are sharply double-edged; with each line she drives a wedge deeper into a system whose unspoken rules seem universally known, albeit widely scorned. Her seemingly ingenuous performance unfolds surely and ambiguously - as quickly as she has appeared, all smiles and sparkling eyes - just as quickly she is taking a self-congratulatory bow and exiting from the stage and the frame. In both telling its own self-absorbed tale and forcing interaction with the projected audience, Betty places ultimate faith in the active presence of an implied audience, playing upon that particular experience they are prepared to have by buying their tickets, occupying their seats, and staring toward the screen in open anticipation. Each of Betty's congenial allusions to her own just rewards and challenges inadvertently hints at darker elements of the structures of artistic production and distribution. I would like to thank all of you who helped me to get here tonight, who really took a risk on me, when maybe it wasn't so clear that it would be worth the effort -- when some of you might have predicted that my road to success would be longer and steeper.I'd like to extend my most profound gratitude to those of you who recognized my vision, the vision that always carried me forward. And I would really like to thank my first director, for having told me, and I don't know if he is here tonight, or if he remembers having said this -- for having told me that sooner or later, I would have to learn, or to choose -- to play real female roles. I'm sure you'll never know how profoundly those words inspired me, and you can never imagine all the things those words challenged me to do. With all of you as my witnesses, I would like to take this opportunity to remind myself that to have arrived to this point doesn't mean to substitute one's name for continuing one's true struggle, or to rely on one's reputation instead of actual work. We all know that this is an industry, of which we are all a part, but I'm sure that none of us, not even for one day-would want to consider himself or herself merely an employee of this industry, or to allow this work to become just another paid job to be done. We've all seen how difficult it is to remain true to one's ideals over the course of an entire career. In this I will surely be helped by all the time I spent drumming my fingers on the tabletop, waiting for the right telephone call, crossing my fingers as each of my bit parts hit the big screen, wondering if the difficult choices I was making were at least the correct ones. I'm saying this here tonight because I want to continue building something substantial, with the same convictions that brought me here, especially in terms of refusing certain types of roles. Paradoxically, as the stakes get higher, refusing may actually become more difficult. This evening the lights are very bright -- luckily -- so I can't even see all of you that have come here to see me. But I'm sure that you know who you are, those of you who trusted your own judgement, and it is with you that I share this victory, and most of all the serenity of this moment. With those of you who were not slaves to fashion, who recognized what I was able to do, instead of just casting some actress whose success was already tested and guaranteed by another casting agent. And so I would like to dedicate this honor to you, to all of you who know first-hand the value of being pushed to your limits, the value of searching beyond the limits of the current imagination, for something that represents the most far-reaching use of your talent.